When I was a kid, I spent a lot of time playing on my own. I grew up in a fairly small community and as luck would had it, my sister had friends around her age, but I did not. So, I found ways to keep busy. I would play cars and do smash up Derbys with them. I would take my collection of stuffies, and have tag team professional wrestling matches, and I would also pay with army men. Once I became a dad, I had this thought in my mind that I would never let my kids play with guns or play war games. Maybe it was because, as an adult, I had seen too much of the real world to want to ever glamourize guns and war. But now that my oldest is almost 9, I am starting to see games with army men and various laser guns as harmless entertainment. 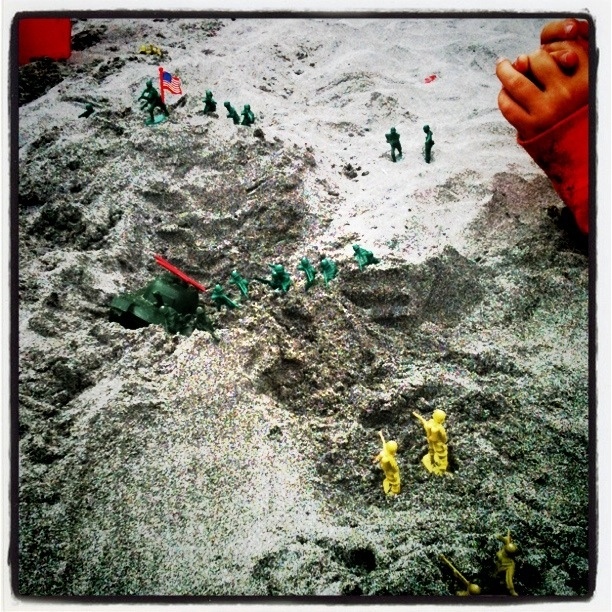 So recently when we decided to head to the beach, I told my oldest son to bring his army men! He and my middle son spent HOURS getting along! Hours. You don’t see them playing so well together most of the time. It could be many reasons, like a blended family, or their 4 year age difference, or that they simply are different types of kids. But seeing them bond over such a simple toy, makes me think there is something more going on here. Like, kids have been playing war games for centuries, and maybe it helps them sort out good from bad. I’m not sure, but I know that the army toys are being put next to the pail and shovel in our beach bag from now on!